Meet Rickety Stitch . . . a walking, talking, singing skeleton minstrel. He's the one skeleton in the dungeon who seems to have retained his soul, and he has no idea why. His only clue to his former identity is a song he hears snippets of in his dreams, an epic bard's tale about the Road to Epoli and the land of Eem. His sidekick and sole friend is the gelatinous Goo, who Rickety alone can understand. Together they set out in search of Rickety's past, with abundant humor and danger galore. Ben Costa is a writer and artist living in the Bay Area. He has self-published two volumes of his award-winning, martial arts historical fiction comic Pang, The Wandering Shaolin Monk. He has also done work for IDW, Viz Media, and SF Weekly. Throughout his life, he has maintained a steady diet of samurai comics, kung fu movies, spacefaring farmboys, and tabletop RPGs. Follow him at @BenCosta. James Parks is a speculative fiction writer and graphic novelist living in the Bay Area. James was weaned on monster flicks, ghostbusting, lightsaber duels, samurai cinema, and comics with a sober dose of Victorian literature and 80s cartoons. James is also the author of the Southern Gothic horror collection The Gospel of Bucky Dennis, was a staff writer for Campfire Graphic Novels, and is a current member of the Horror Writers Association. 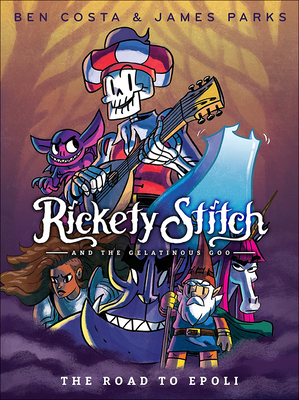 Find out more about Rickety at RicketyStitch.com."